Pain Free and Drug Free? Why Consider Low Light Laser Treatment? Like most of us, I carry a lot of stress in my shoulders, felt like the weight of the world. Yes meds helped, massage helped, but it never went away, it was a constant debilitating pain.. But after a couple days of using this new low light laser therapy device, well my shoulders never bother me at all. I know It is hard to believe that the key to being pain free, is a drug free, non invasive form of medicine that helps the body, at the cellular level, to heal, reduce pain and inflammation at the source, and can create a safe and effective solution for your chronic pain, wound healing and arthritis. 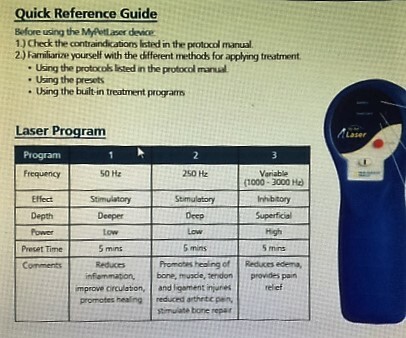 In my last post, (https://moredogsmorefun.com/the-truth-about-low-laser-therapy) I explained what low laser light therapy (LLLT) is, how it works, and how the Food and Drug Administration classifies laser units. If you haven’t read it, or if you are not sure if Laser Therapy is right for you, PLEASE take a minute to read it. I have written it with the average person in mind and hopefully, you will find it educational and enlightening (pun intended).. This post is a review of what I believe to be the best laser unit on the market, for the beginner, and for at home use..
let me explain a bit about my practical experience with low laser light therapy. I am an active person. I have a small farm where I train horses and dogs and teach riders and handlers and with the help of my family, We do all of our own farm maintenance and gardening. If I am down and out due to pain of any sort, the well oiled machine of getting the things done that need to be done comes grinding to a painful stop. Basically, I do not have time for pain. I have watched the evolution of Low light laser therapy since the late 1970’s. As a young Equestrian, I had used just about every small laser light device that I could afford at the time, on both myself and my animals. I also was fortunate to be able to borrow a lot of devices that belonged to sales reps or veterinarians. I used devices that were a “pad” of LED lights and a small device that used pulsed electromagnetic field energy, but my favorite and most helpful were the large Class IV devices that I would borrow from my Vet. Class IV Laser Devices had been the most powerful and the most dangerous (creates heat, can burn skin and damage eyes) devices on the market, but that power also brought the best results . So you can understand my excitement when this new generation of lasers hit the market that are as powerful or more powerful then the Class IV lasers, SAFE enough to be classified as a Class I by the FDA, affordable for the at home user and cordless, making it easy, and convenient where ever I am on the farm. This is a medical grade device that has just recently become approved for private purchase. My Pet Laser is a multi-wavelength, synchronous multi-light source Photobiomodulation device that incorporates a Super Pulsed Laser (GaAs 905 nm), an ultrabright infrared and red LEDs (875 nm and 640 nm) with a mean output of power of 133 mW. 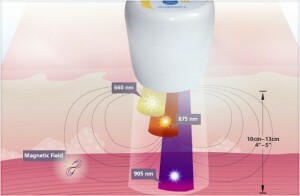 The combined wavelengths of the light “core” optimize the biological effects of the entire phototherapeutic window to accelerate recovery and reduce pain. This Product must have the big pharmaceutical companies worried to death. Everyone should have a low light laser therapy device. I use this unit on my arthritic hands (otherwise I would not be typing this) and later tonight I will use it on my corgi. This unit is SAFE! Only pregnant women and people with pacemakers need to seek professional guidance. This unit can be used on any living being in your house with acute or chronic pain including your dogs, cats, horses.. everyone! I absolutely love the Quick Reference Guide that comes with this laser.. It tells you exactly which of the three settings to use for the effect you are needing. 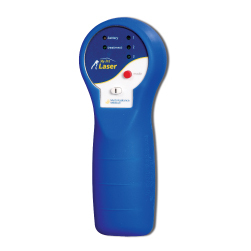 This low light laser therapy device comes with the blue protective sleeve and a plastic case that includes the charger. It also comes with a 2 year warranty with an option to purchase another 3 years. Multi Radiance Medical has a small inside sales department that handles the needs of the outside sales force. For best support and better price , purchase from an outside sales representative that is trained in all aspects of low light laser therapy its use and classes.. This units price is listed as $ 2,995.00. Outside Sales Representatives can often find creative ways to lower the price or can include e-books on methods etc. Multi Radiance Medical technology uses different frequencies simultaneously and can penetrate up to 4—5 inches deep into the target tissue. Before buying any other Low light laser therapy device, Please read carefully.. there are recently, a lot of laser and light therapy devices in many of the high end catalogs, that with a little tricky wording in the descriptions, leads one to believe that the FDA has something to do with approval of these devices where in reality this is just crafty marketing. Most of these products do no harm, but do not deliver the needed light energy to treat tissues beyond a few centimeters. These MRM Laser units are used in 80% of chiropractic colleges world wide. They are used in all the top Veterinary Universities and by the Olympic Equestrian teams. Athletic directors for many major league teams Use MRM laser therapy to keep their players on the field. Therapeutic lasers are getting better every year. 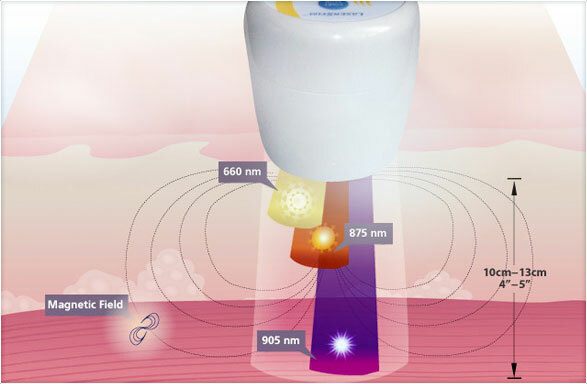 These new lasers that have now entered the marketplace provide deeper tissue penetration, higher power densities and reliable electronics to achieve better clinical outcomes. The Multi Radiance Medical ” your Pet Laser” really is the ultimate safe and affordable solution for chronic pain, wound healing, and arthritis for all your family members. It is A New, Better Idea in Pain Management. What does Low Light Laser treatment feel like? Does it hurt? There is little or no sensation during low light laser treatment. Some report feeling a mild, soothing warmth or tingling. Within the more then 4000 studies and with more than twenty years of use by practitioners around the world, very few side effects have ever been reported. If a patient is allergic or ultra sensitive to light they may get a rash for a few days. Occasionally, as the healing response occurs, some chronic injuries or pain syndromes may initially feel aggravated post treatment . Depending on the condition and the size of the area being treated, The average treatment duration is 5 minutes. How frequently should a patient be treated? Acute conditions can initially be treated once or twice a day. Chronic conditions respond best when treatments are received 3-4 times per week. You may feel results after your first treatment. Each treatment is cumulative and most patients feel results after 2-3 sessions. 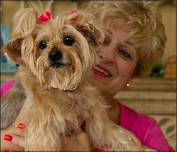 Owner’s Report: Our little Yorkie, Mia, has been a very special part of our life. But, at 13 1/2, there were many times she had a hard time just getting up in the morning. We’ve known since her birth that she’d been diagnosed with subluxating patellae, but we’d resisted the thought of putting her through surgery until recently. We tried meds, but they didn’t work. The orthopedic surgeon told us on a four scale, she was a 4 on the right side and 3 on the left. Fortunately, a good friend and animal nutritionist told us about your laser therapy. We tried it and it has worked very very well. We just wish we’d known about it sooner, she is much more comfortable. We couldn’t believe it could make such a difference, but it has and we now highly recommend it for anyone. Thank you. Do you have a laser story you would like to share? Low light laser therapy has helped me so much…I’d love to hear your story.. Please take a minute and drop me a line below.. May we all be Pain Free and Drug Free…! Interested in purchasing a MRM laser for your own use? Want to know more? Email me at moredogsmorefun@gmail.com or fill our the contact form and I will have a sales representative contact you to help you get the best price on the unit that will suit your needs and answer any questions you might have.. Thanks for visiting.. wishing you a blessed and pain free day! These are COOL! Unlike earlier versions that can be bought on amazon, these “smart” tags will last for years. These tags contain the latest in digital Smartphone Technology. Like a normal rabies tag, each tag shows the current required information, the Vet Clinic name and phone number on the front, but on the back, the tag contains a QR code that provides key information on the Pet, the Owner and the Veterinary Clinic. Each Tag also provides a digital Pet Health Profile with the Pet’s complete medical and vaccination history. And if the pet gets lost, a finder with a smartphone can scan the tag which will automatically send a text and an e-mail alert to the owner and a GPS location of exactly where the pet is. If your vet doesn’t have these yet, Have them contact Stone manufacturing &Supply Com. 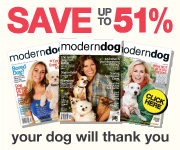 AlsoCheck out this web site http://www.vetidtags.com This is where you go to register your pet’s tag.